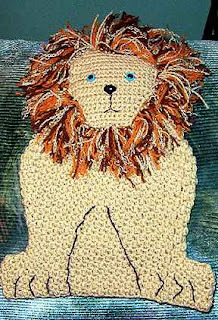 The first pattern in my Animal Gift Bags is the Lion Stocking/Gift Bag shown below. Pattern is available in my Etsy store for $3.95. Because it is a 'special' pattern, it will not be available on my site, and therefore is not part of a membership. Also, coming soon, the return of my Club Pack Membership. I am ironing out details as per price/quantity of patterns, so stay tuned. For a short time (at least--I may continue this one) the year long membership will still be available, for $30, you will receive all new patterns on my site, a minimum of 4 each month, for 1 year. 48 patterns in all. For the Lion Stocking and for the Year Membership, you can use the buttons on the side.